Amtrak Acela Express Revenue Trains Page 1-! !-Stan's RailPix. Amtrak Acela Express Revenue Trains Page 1. High Speed Rail...the future of the Northeast Corridor. Amtrak's new Acela Express high-speed service made history during the weekend of May 12 and 13, when it reached 100,000 riders in just five months of service. " -Click here to see Amtrak Acela #2032 leading the new non-stop, Washington, D.C. to New York, Amtrak Acela Express Train #2180. It is speeding north (east) in the snow near Tacony Station (MP-78.2), Philadelphia Penna. This train really kicks up the snow ! 3/6/01. 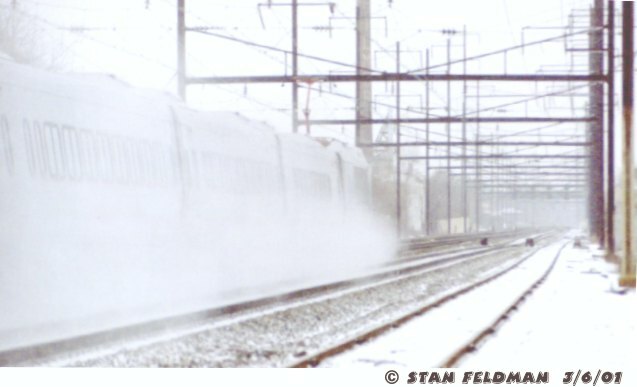 Click here to see Amtrak Acela Express Train #2180 in the snow, as it blows past Tacony Station in Phila. 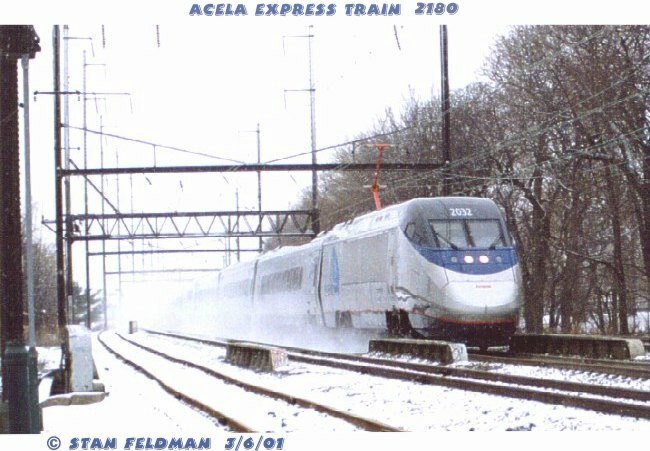 Pa. Due to the shape of the Acela Express it kicks up much more snow than an AEM-7 powered Metroliner. 3/6/01. 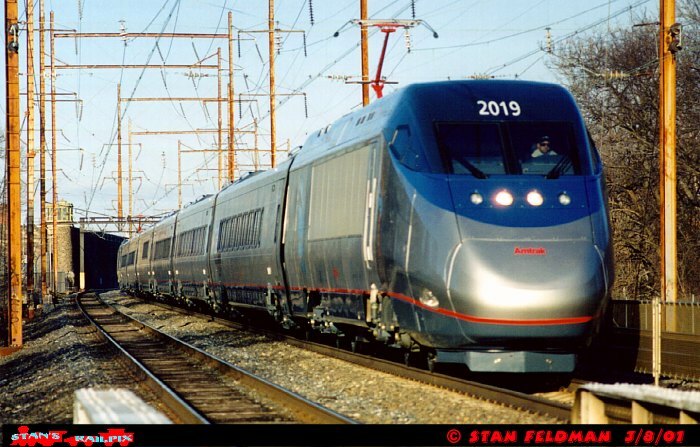 Click here to see Amtrak Acela #2019 leading the new non-stop Acela Express Train #2183. The Acela Express is running south (west) past Holmesburg Junction, Philadelphia Pennsylvania. 3/8/01. 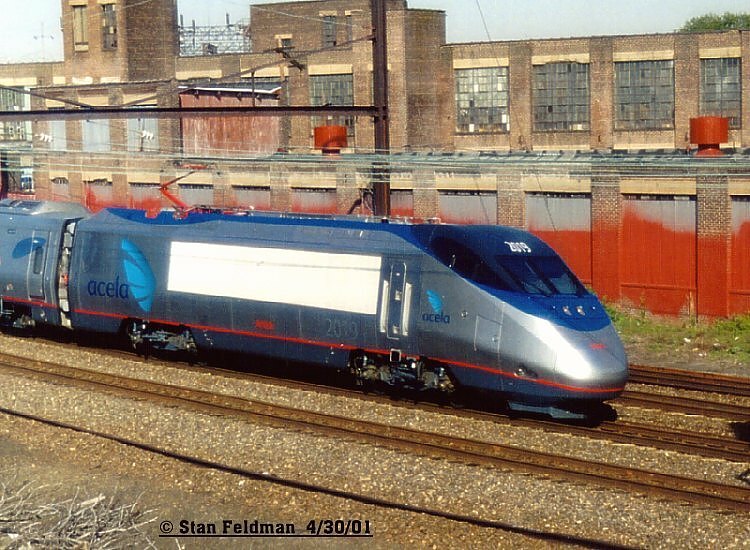 Click here for a side view of Amtrak Acela #2019 in the bright morning sun. 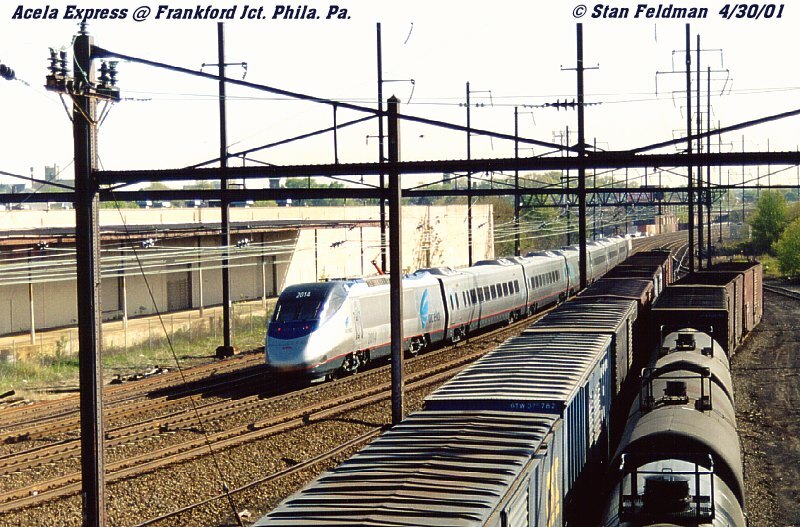 It is leading Acela Express Train #2180 as it rounds the curve at Frankford Junction, Phila. Pa. 4/30/01. Click here for a rear look at Amtrak Acela Express Train #2180 as it passes the Conrail Yard at Frankford Junction, Phila. 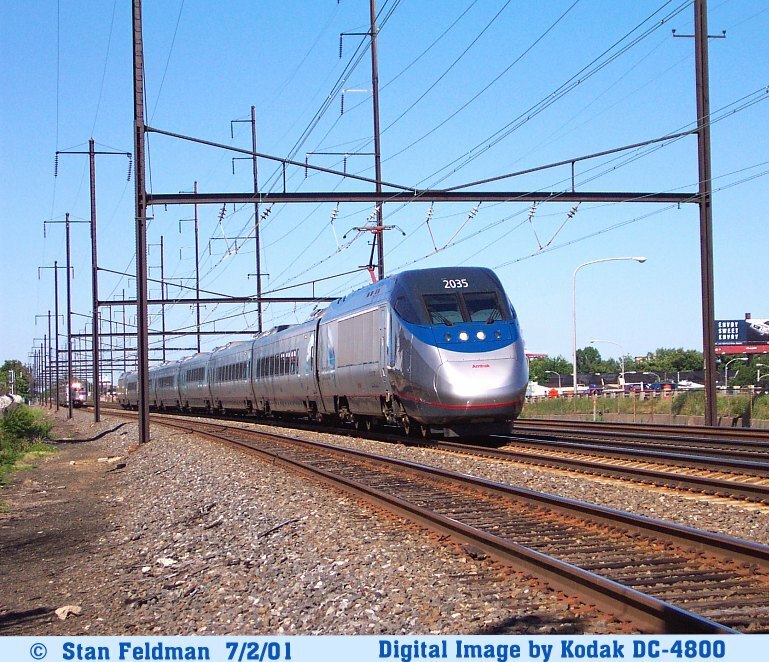 Pa. Amtrak Acela #2014 is on the rear and Amtrak Acela #2019 is leading. 4/30/01. Click here to see Amtrak Acela #2014 leading Acela Express Train #2183, that now runs from New York to Washington D.C. with a stop in Phila. Penna. The Acela Express is in Holmes Interlocking (MP 77.2) heading south (west). Philadelphia Penna. 5/10/01. Click here to see north (east) bound Amtrak Acela Express Train #2170. Amtrak Acela #2036 is leading the Acela Express Train through Holmesburg Interlocking, Philadelphia Penna. 5/10/01. Click here to see Amtrak Acela #2017, on the rear of Amtrak Acela Express Train #2170. The train is passing through Holmesburg Junction Station, Philadelphia Pennsylvania. 5/10/01. 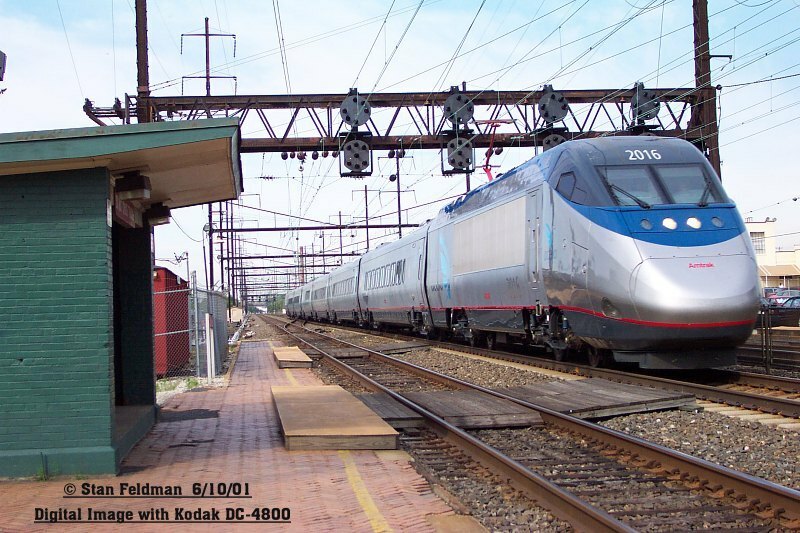 Click here to see Amtrak Acela Express Train #2180 with Acela #2016 in the lead. It is passing through Holmesburg Junction, Phila. Pa. Digital Image with Kodak DC-4800. 6/1/01. 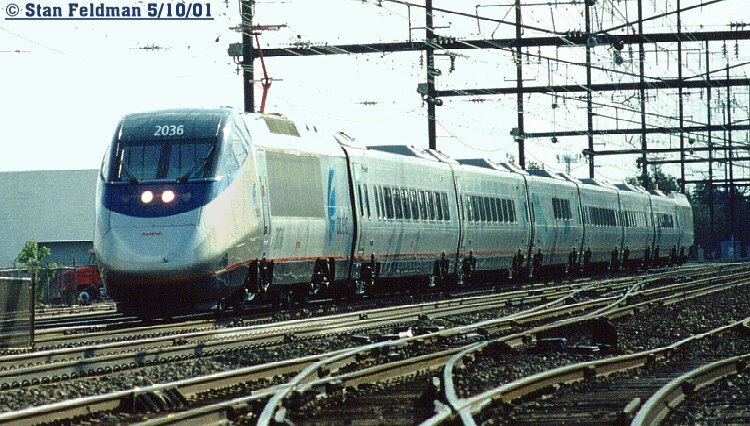 Click here to see Amtrak Acela Express Train #2183, with Acela #2035 in the lead. It has just passed a Septa R-7 Regional Rail Train and is running south (west) at Wissinoming Station, (MP-79.3), Phila. Pa. Digital Image taken with a Kodak DC-4800. 7/2/01. Click on the new Amtrak Logo for Acela Express Schedules. 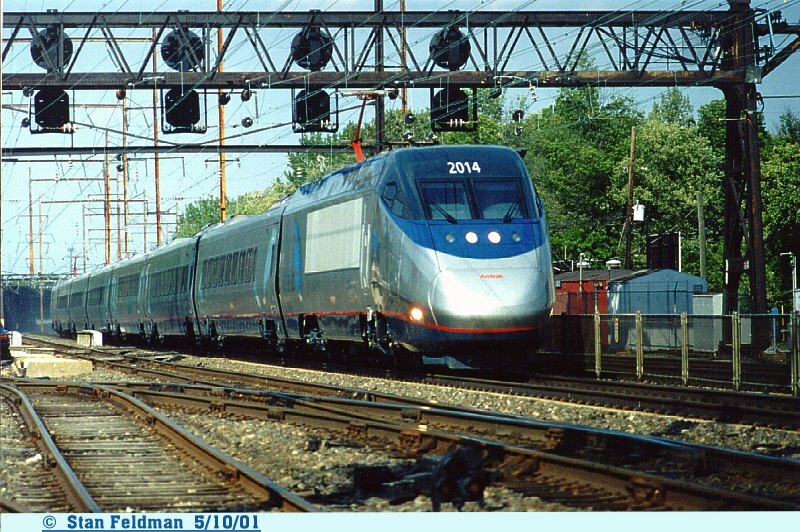 Philadelphia Pa, 5/14/01 - Amtrak's new Acela Express high-speed service made history this weekend, when it reached 100,000 riders in just five months of service. "Acela Express has continued to perform consistently in ridership, ticket revenue and on-time performance," said Stan Bagley, Amtrak's Northeast Corridor President. "We are confident that as we continue to add more service throughout the year, even more people will choose our convenient, comfortable, world-class service here in the Northeast Corridor." Amtrak celebrates the milestone today, providing free sodas and coffee to all guests on-board each of the four Acela Express round-trips it currently offers. Amtrak will also raffle off a pair of round-trip tickets on Acela Express. Amtrak launched Acela Express service December 11 with one round-trip traveling from Washington to New York and Boston, and has continued to expand service, now at four round-trips weekdays and two-and-a-half round-trips weekends. Additional round-trips will be added throughout the summer and fall, bringing the total to ten round-trips between New York and Boston and 19 round-trips between New York and Washington later this year. During the first five months of service, December 11-May 11, Acela Express exceeded more than 100,000 riders and earned more than $11.9 million in ticket sales, beating projections by three percent. The service ran on time or early 341 of 370 trips. Also, 109 (nearly 30 percent) of those trains arrived at least 10 minutes early. Based on the 15-minute tolerance utilized by the airline industry, Acela Express averaged overall on-time performance of nearly 93 percent (92.7%) throughout the Corridor. According to the most recent statistics kept by the U.S. Department of Transportation, for the month of March 2001, nearly 20-percent of the flights from Boston's Logan Airport to New York's LaGuardia Airport arrived more than 23 minutes late. How to Link to Stan's RailPix ! Click here for Acela Test Trains. Amtrak Acela Express Inaugural Run Slide Show. Click here to see images of Amtrak Acela Express Train Set. Click here to see images of Amtrak Acela, High Horsepower Locomotive HHP-8 #651. 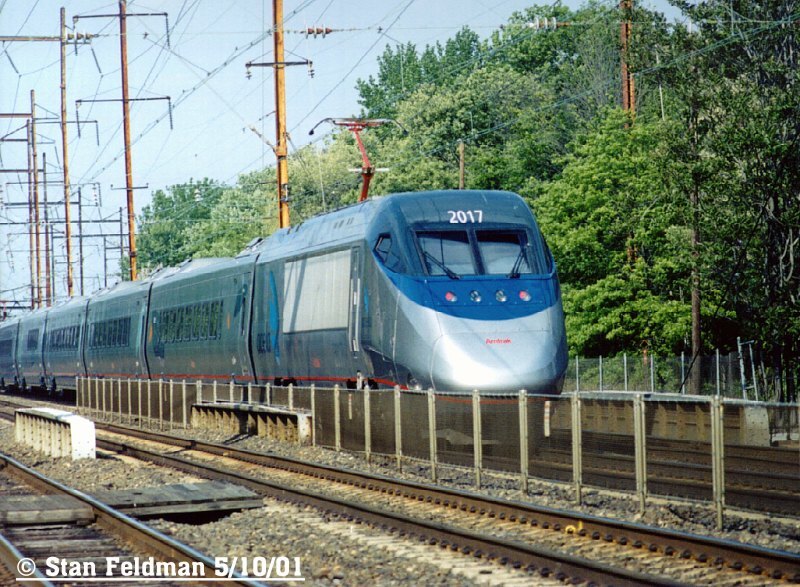 Click here to see images of Amtrak Acela Regional Trains. Click here to see images of The ICE Train, and The X-2000. They were tested by Amtrak in Metroliner Service in 1993. Thank You !! Please click below and go !! A Complete List of all Photo Pages is on the Site Map Page.